Aidyl, welcome to Homeschool Authors. Tell us a little bit about yourself. Thank you, Sarah. You’ve got a great blog and I’m excited about being interviewed on it. Let’s see: I’m a twenty-year-old girl who writes, lives in a barn, works on a private retreat, travels the world, and helped build a life-size model of a dinosaur. Exciting, right? More importantly though I’m a follower of God and hope to change the world. That’s me in a nutshell. A very little nutshell. What did I enjoy most? That’s a hard one! I really liked the freedom to learn according to what I was interested in. Meaning I could focus more on the writing aspect of school then math (although I did do math! ), because although I need math skills, I don’t have the desire to be the greatest math-brain of all time. Plus, being around my family and learning what my parents wanted me to learn was great. A big thing about writing is you don’t (generally) have a boss hanging over your shoulder hounding you to keep going. Same way with writing. You have to learn to be responsible (which everyone does, but I think homeschooling helped me with this). Also, I think I had more time than the average kid my age because I could incorporate writing into my every-day-schooling. And if I found a subject that was more interesting to me, I had the freedom to study it in more depth which is how I started writing in the first place. 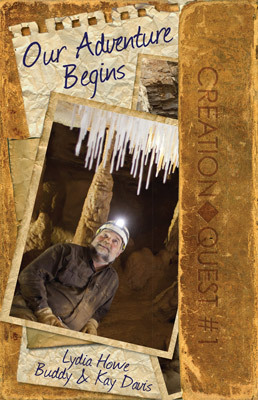 What inspired you to write Cave Secrets of the Pterodactyl? I love Christian apologetics. The Bible tells us in 1 Peter 3:15 "But sanctify the Lord God in your hearts: and be ready always to give an answer to every man that asketh for a reason of the hope that is in you with meekness and fear:". I wanted to help kids learn to defend their faith while still having fun. It’s written by a twelve-year-old wannabe writer who is based off of me. She travels around with her parents, Buddy and Kay Davis and works at the Creation Museum. She gets to have a lot of adventures while on the road. Where can people get Cave Secrets of the Pterodactyl? It’s written mainly for kids 8-12, but I think others would enjoy it as well. Are there any books that you would recommend for those who enjoy Cave Secrets of the Pterodactyl? Tim Chaffey was my first editor. He has some cool creation books as well. I actually go by two different names, depending on what I’m writing: This book is published under the name of Lydia Howe. It's so neat that Answers in Genesis carries your book. Congratulations!